The Ebola virus has killed more than 9,000 people – about 2,000 in Guinea, 3,000 in Sierra Leone and 4,000 in Liberia. The outbreak started in Guinea in December 2013, but the Ebola crisis really started in April 2014 when it began to spread. The initial international response was deemed “totally inadequate” by British MPs. Since then efforts have improved, but here are six lessons that can be learned from the problematic initial response – from the problems highlighted by the MPs – and especially pertinent to those states that have the capacity to react to epidemics. The four-month absence of reaction by the WHO had terrible consequences for the areas affected by the Ebola virus, in a large part because governments which had aid programmes that could be used for epidemics chose to follow the advice of the WHO. If the international community had reacted straight away, the outbreak could have been contained. States should rely on the expertise of doctors on the ground, or make sure that the WHO has a similar level of expertise if that is the advice they want to follow. And the WHO should not replicate the work conducted by NGOs. The international community should address the fact that medical facilities were insufficient in Sierra Leone, Liberia and Guinea. At the outset of the outbreak, there were only 40 doctors for a total of 4m people in Liberia, 120 doctors for 6m people in Sierra Leone, and 1,200 for 12m people in Guinea. Senegal and Nigeria, which reacted as soon as people were diagnosed with Ebola, have a more developed infrastructure of medical services, and local doctors were able to respond to the Ebola outbreak. In Nigeria, experience working to eradicate polio particularly helped. However, in general, more doctors are desperately needed in the following states, which have fewer than 100 doctors for 1m people: Guinea, Ghana, Congo, Mali, Cameroon, Timor Leste, Guinea-Bissau, Zambia, Zimbabwe, Benin, Senegal, Togo, Papua New Guinea, Rwanda, Eritrea, Lesotho, Central African Republic, Burkina Faso, Mozambique, Chad, Somalia, Burundi, Equatorial Guinea, Ethiopia, Haiti, Sierra Leone, Malawi, Niger, Liberia, and Tanzania. To put this into context: the United Kingdom and the United States respectively have 2,800 and 2,400 doctors for 1m people. The UK had no detailed contingency plan for a sudden medical emergency. According the parliamentary report, when the Ebola crisis was in full swing the UK could only send 55 health professionals to stricken countries, whereas Cuba committed 165 at various grades to work in the UK-funded treatment centres. The British government relied on Save the Children to run Ebola facilities, but this NGO had never done this before, and the first facility was only set up in November 2014. Funding – for example for aid – is one thing but expertise that can be deployed by international actors and especially local actors in emergencies is also important. The Department for International Development and other funding organisations could focus their aid on education and health facilities. China, for instance, opened a hospital in Sierra Leone in 2012 and in Liberia in 2011 and 2014. The United Kingdom, the United States and France revoked the licences of planes with direct flight paths to the regions where people were ill with Ebola, despite the absence of scientific justification for doing so. This made it harder for NGOs and doctors to access the region. The Ebola crisis led to unnecessary panic in the United States, but it is the responsibility of governments to look at the science and reassure rather than add to it. And shame those who do not contribute enough. Until now, the UK and the US have been the most involved in committing funds to fight the Ebola virus. However, taking into consideration the population of each state, the British donated twice as much as the Americans. The states lagging behind have been Germany, France, Canada and especially Italy. Ebola is a threat to all people in the world: every donor, and not only former colonising states, should be engaged in fighting the virus. One of the reasons why there was no vaccine for Ebola was that it concerned few people in remote areas in African states. Margaret Chan, Director-General of the WHO, said that Ebola vaccine was never developed “because it only affected poor African countries”. Ebola was not the priority of governments and pharmaceutical companies. 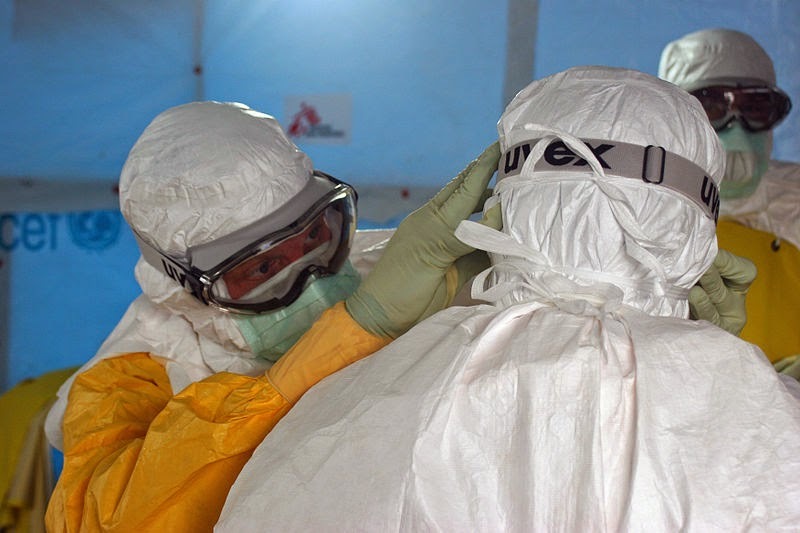 Research on Ebola has been conducted in North America, Europe, China and Africa. However, more research is needed, and vaccines against viruses such as Ebola or Marburg should be commercialised, and made available cheaply.